As digital dictation has replaced the analog tape based systems and merged with the computer system PCS has kept pace with the changing technologies. From Law Enforcement, Legal Offices, Accounting professionals and the Medical industry we have installed and implemented solutions that reduce costs and improve work flows. Whether you do in-house transcription, remote transcription as a services or just need a backup of an audio conversation we have a solution. 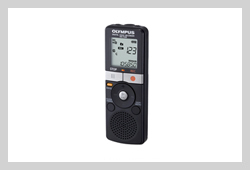 PCS provides Olympus Professional Dictation Systems designed to meet professional dictation requirements and let you streamline your workflow.